Electri-Flex Company manufactures many types of low-smoke, halogen-free (LSZH) flexible electrical conduits that virtually eliminate the release of the toxic gases found in PVC products. Current trends show increasing use of LSZH conduit, where smoke from fire presents an increased hazard to people. Applications include aircraft, ships, recreational vehicles, tunnels, mass transit vehicles, elevators, and other confined spaces. LSZH reduces the amount of smoke and flame spread, which can allow people more time to easily escape areas of fire. Electri-Flex Company offers six types of halogen-free product lines in a broad array of variations dedicated to specific applications. Its proprietary formulation of thermoplastic polyurethane combines low smoke, flame retardation, and toxicity generation characteristics, virtually eliminating hydrogen chloride, hydrogen fluoride, and hydrogen bromide gases during a fire. Third-party testing of the polyurethane compound used by Electri-Flex for flexible jacketing material demonstrated that performance is far better than required by industry-accepted standards. Type ZHLA is both UL listed and CSA certified and made with a polyurethane jacketing with a hot-dipped galvanized steel core. Working temperature range of -40° C to +80° C in air, +60° C when wet, and +70° C in oil. Type CEA has a polyurethane jacket and corrosion-resistant plated steel core and is designed for applications such as wiring harnesses within and under passenger train cars, as well as subways, tunnels, and enclosed public areas. Type ACEA is similar to Type CEA but has a core of an aluminum alloy strip that reduces its weight to half that of Type CEA while also providing flame resistance and limited smoke characteristics. Each has a working temperature range of -40° to +80° C.
Type ATX refers to the non-UL conduit line capable of withstanding extreme temperature ranges. This conduit combines the flexibility of the standard LT core with the advantage of a thermoplastic rubber jacket that is unaffected by temperature extremes and contains zero halogens. The material has a flammability rating of UL 94-HB and is UV stabilized. Temperature range spans from -60°C to 150°C, intermitting to 165°C. Type CLFR is a part of the Corrlok system of corrugated flexible tubing made from a flame-retardant Nylon 6 compound that provides low flame spread and smoke as well as limited toxic characteristics. It’s tailored for use within public transit and passenger rail vehicles, machine tools, medical and industrial control equipment, and a slit version is suited for protection of wiring harnesses in aircraft. 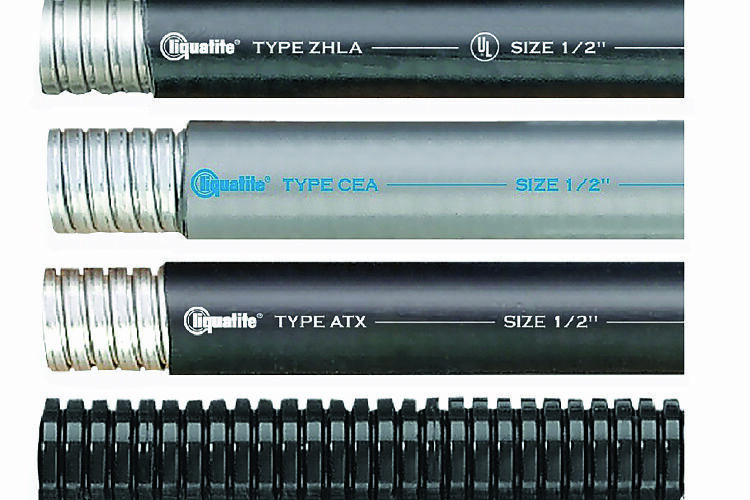 The company also offers the option of halogen-free-jacketed shielding conduits in the HFSLA, HFEMS, and HFEMCS families with a polyurethane jacket extruded over them that are better suited than standard conduits for data transmission circuits that require EMI/RFI shielding protection and are in a confined space such as a data center plenum floor.